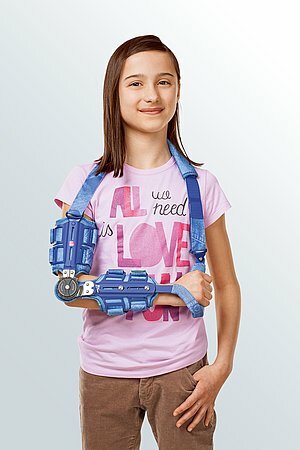 protect.Epico ROM is an elbow orthosis. 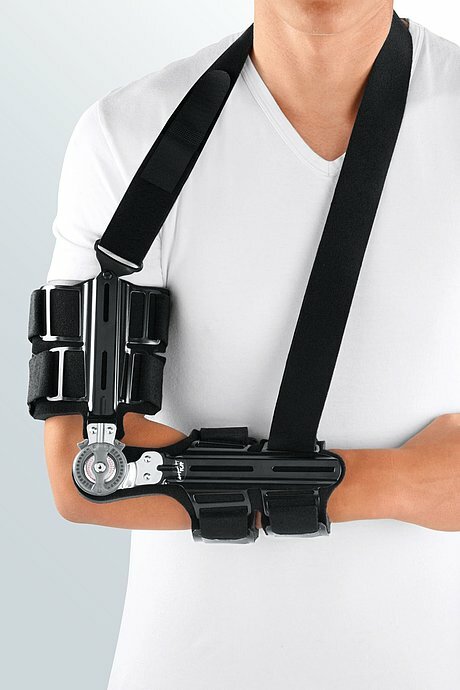 The product is exclusively to be used for the orthotic fitting of the elbow and only on unbroken skin. Movement is limited to 0°-120° in the joint to guarantee movment flexibility. This enhances joint mobility and accelerates healing. 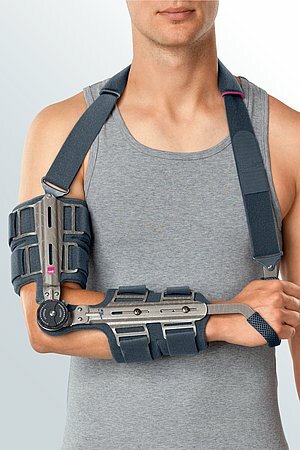 Open all the Velcro straps and put the brace on so that its joint lies directly over the lateral epicondyle. Guide one end of the neck strap through the ring on the arm cuff and fasten the Velcro. Pass the other end over your shoulder, guide it through the ring on the hand rest, and fasten the Velcro. The pads can be trimmed to size with scissors if necessary. To set the radius of motion, first press the grey button during flexion and simultaneously shift the joint to the desired number of degrees. Repeat this process for extension. The pads can be washed by hand in mild, cold soapy water. Rinse thoroughly. Do not wring out. Leave in the air to dry. Do not iron. Soap residues may cause skin irritation or damage to the material. When used normally the joint mechanism is maintenance-free. However, in exceptional circumstances the hinges can be lubricated using Teflon™ spray. How to use our protect.Epico ROM elbow. Date of issue: until April 2019. How to use our protect.Epico ROM elbow. Date of issue: from April 2019.